A beautiful pair of brushed platinum earrings with white, pink and blue diamonds. This bespoke pair of trilogy earrings was designed by the customer to match their existing platinum, coloured jewellery pieces. Once the design was finalised it was created on CAD, approved by the customer and then send to the casting company. The earrings were cast in platinum. 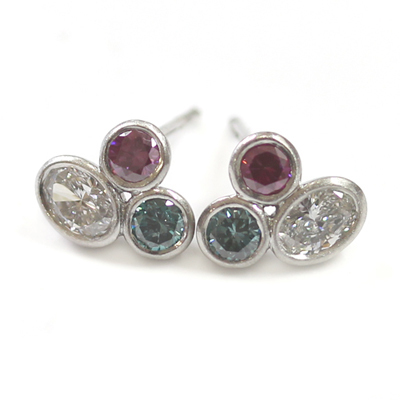 Our expert team then sourced a selection of coloured diamonds for the customer to view. This is a special service we are able to offer as a bespoke jewellers. The customer chose oval cut white diamonds. Then to contrast, round brilliant cut, deep pink diamonds and round brilliant cut, blue diamonds. A beautiful and bright combination. All the diamonds were hand set in a rub setting ensuring a tactile finish. For a final design feature, the earrings were given a brushed finish. 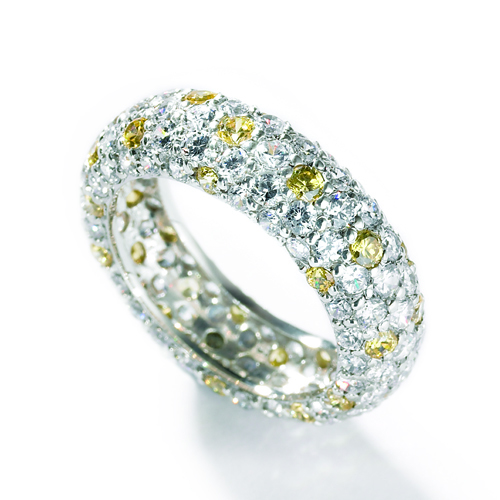 This creates a matt effect keeping the attention on the sparkling colourful diamonds. A bold and beautiful aquamarine and diamond cocktail ring. The customer came to us with a collection of aquamarine and diamond jewellery that they no longer wore. They were looking to remodel their precious gems into a bespoke cocktail ring to suit their current style. After meeting with our expert jewellers in our Leeds studio, a bold and bespoke design was developed. It was decided that the customer’s large cushion cut aquamarine would be rub set at the centre of the ring. Three round brilliant cut diamonds would then flank it at either side. The diamonds were also hand set in a unique setting which matched the dramatic cushion shape of the aquamarine.